In 1967, even as the mighty QE2 glided down the ways at the John Brown shipyard in Clydebank, predictions abounded that she would be the very last passenger liner built for the North Atlantic. In fact, Cunard had wisely designed her for both cruising and trans-Atlantic crossings and thanks to sound marketing and the legendary appeal of QE2, she continued to sail and enthral right up until her retirement in November 2008, breaking all records as the world's most-travelled and most successful liner ever. 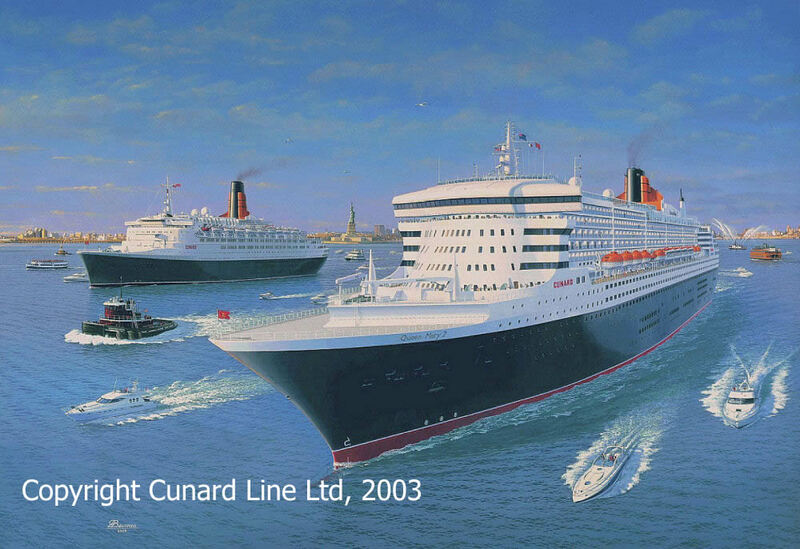 The spectacular growth in the cruise industry in the late 20th Century prompted Cunard to unveil plans to build the first true transatlantic liner since the 1960s. Heralded as the world's most expensive and largest-ever passenger liner, Queen Mary 2 entered service in January 2004 amid a blaze of maritime publicity not seen for decades. As part of her series of maiden voyages, QM2 in company with QE2 left New York Harbour on the evening of 25 April 2004 at the start of a thrilling combined transatlantic crossing. Not since the 1940s had two Cunard Queens berthed together in New York, and never before had two Queens sailed within constant sight of each other right across the Atlantic. Aboard QM2 is a set of commissioned oil paintings created in 2003 by Gordon Bauwens, the maritime artist who created Cunard's official QM2 artist impression. Cunard Queens, one of two large works by this artist hanging in the magnificent Grand Lobby, welcomes passengers aboard Cunard's new flagship and features the scheduled start of this unique tandem transatlantic crossing in April 2004. As the main 295 Ltd Edition has sold out, we can offer 25 only museum quality Artist Proof giclee prints of this much admired painting, while stocks last. These superb digital reproductions are produced on heavy weight 300-gramme watercolour art paper using inks with a light-fast rating of 75 years. Each highly collectable Artist Proof is signed and numbered by the artist and comes with matching Certificate of Authenticity. "The introduction of Queen Mary 2 into the Cunard Line fleet represents another milestone in the history of this illustrious company founded in 1840. This historic event has been commemorated by marine artist Gordon Bauwens and in doing so he is to be congratulated for the way he has captured the elegance and grandeur of this magnificent vessel." "When QE2 and QM2 sail from New York to Southampton together, it will be truly a unique event in the history of trans-Atlantic travel, and for my part I will be very proud to be Master of QE2. I am both pleased and honoured to see that Gordon Bauwens has seen fit to record this in such detail in his paintings."